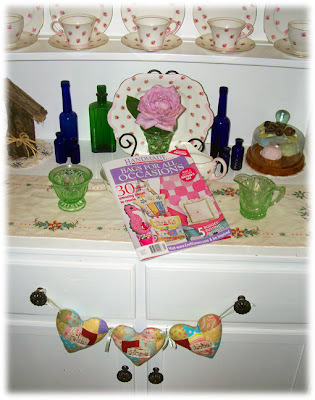 Sewing Room Update & A Project!! 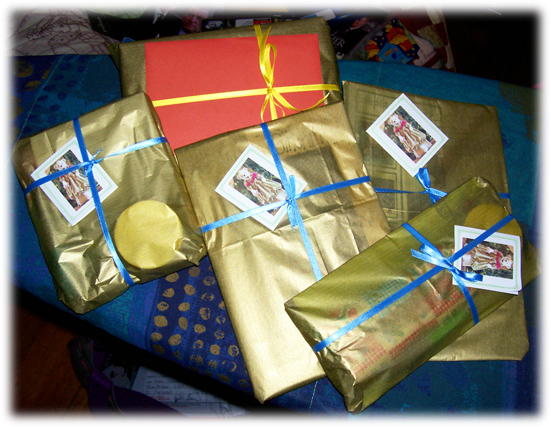 Goodies, Gifties & Still Going! 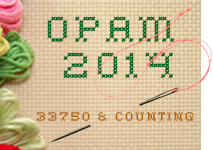 De-Cluttering Update & OPAM Winners!! I'm Gonna Be RUTHLESS ... Sort Of!!! 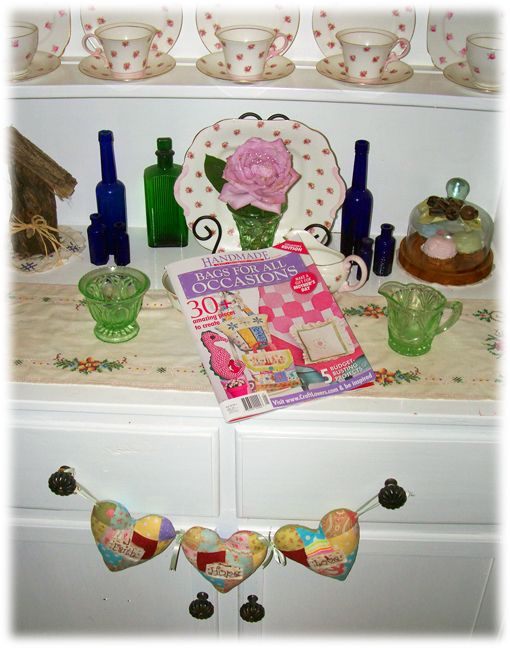 Here I am, as promised to give you a sneaky peeky at the progress in my sewing room makeover. While I knew this would be a pretty big task, I had no idea just how EPIC it would become! Ben Hur's got NOTHING on the makeover of my sewing room! Tee! Hee! Hee! 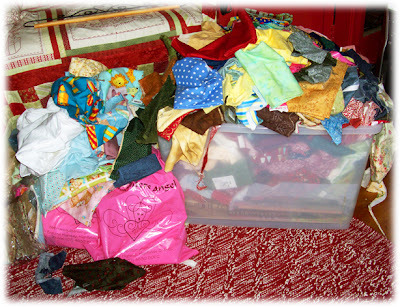 The embarassingly-numerous garbage bags of rubbish that have been taken from the sewing room ... so far!!! Me tip-toeing around previously mentioned leaning towers in the middle of the night when I go 'walkies'!! This is where one side of the ugly built -in cupboard was torn out and it's now a nook just the right size for my new sewing desk ... which is also finished. I LOVE how it's come up and it's so sturdy that this baby will NOT be a-rockin' when I get my faithful Huskie fired up! :0) We've got two shelves installed above it and you can see how the baskets of my fabric stash will be stored ... most of those baskets are empty yet ... except for one ... can you spot it?? It's a bit like "Where's Wally?" Tee! Hee! Hee! 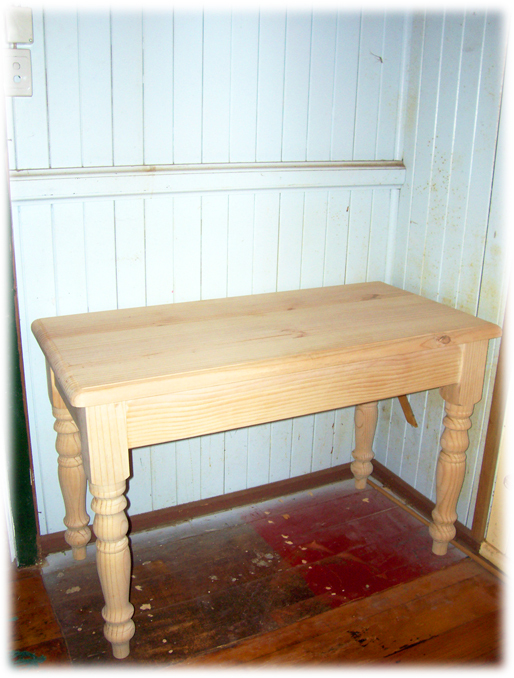 We'll put another shelf above these that will house some of my 'pretties' and pattern samples. Still tossing up what to do about that section of the floor ... at this point, a mat is sounding like a great solution! :0) Oh ... the doorway into the sewing room from the hallway is just to the left of this pic. A funny story about this photo, my Huskie and my Hubby ... 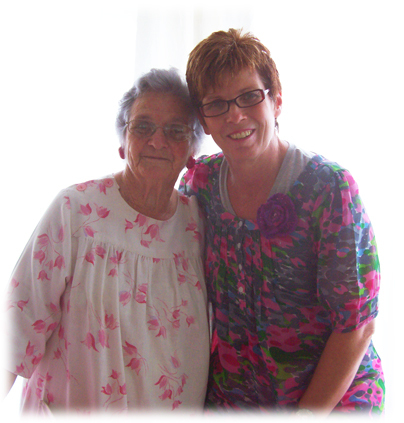 I had been complaining loudly to GB that I hadn't been able to sew for over three weeks now and was suffering withdrawal symptoms. He'd obviously taken this on board (or was just sick of hearing me whinge!!) 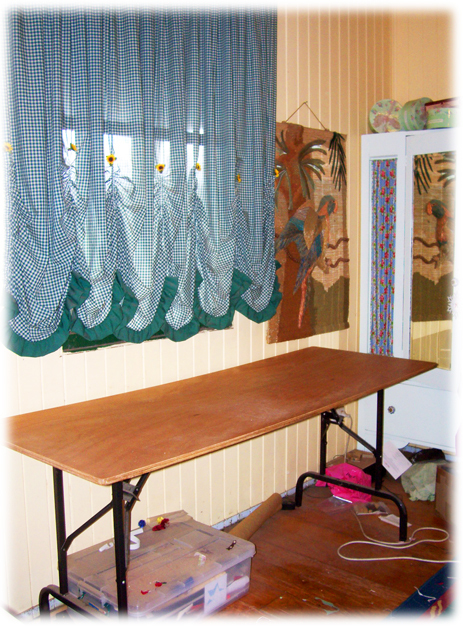 and emerged from the sewing room and very proudly told me that he'd cleared the spot for my new sewing desk and set my machine up on it, so I could now sew. I thanked him very much ... then pointed out that, actually, besides the fact that there's a lot of construction clutter and saw dust around that I wouldn't want to get on my fabrics, I still can't sew because ... the machine's power cord and pedal aren't attached! Tee! Hee! Hee! They were put somewhere 'safe' during the packing up of the old sewing table and I haven't rediscovered them yet. But .. it's the thought that counts, right?! :0) What a sweetie my GB is! You can see that my made-over cupboard now looks right at home in this room ... the fabric panels were the inspiration for the wall colour. This window looks out onto our front verandah ... still deciding what style/colour curtains/blinds to put up here ... it needs SOMETHING, cos we're on a corner and have three bright street lights beaming into the front of our house at night. Since the daybed in the sewing room is sometimes used as an extra guest bed ... having something at the windows for privacy and to block the light to allow guests to sleep is a must. 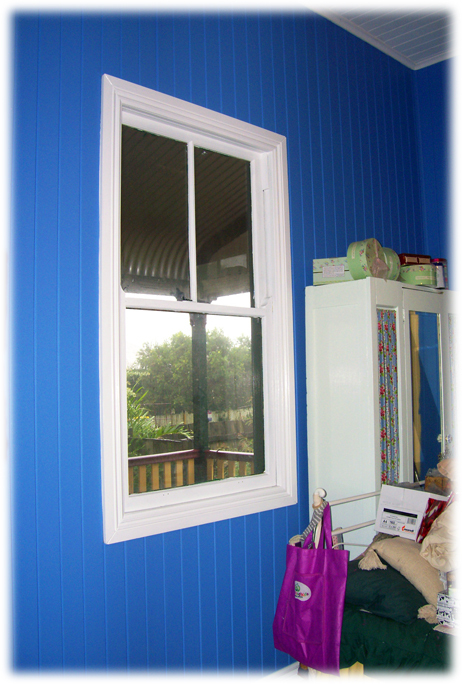 The window already looks heaps better than before we began ... it didn't have any trim around it and looked a little shabby ... now it looks bigger and stands out nicely against the blue. Hopefully a bit more progress will happen tomorrow - it's our Show Holiday and although I'm working (Highfields where I work has a different show holiday!) 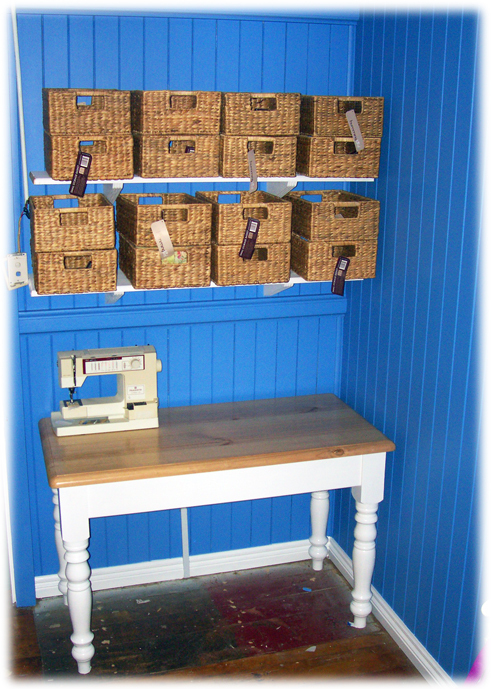 GB and his Dad are going to do a bit more on the sewing room makeover, then we're at the weekend again ... will update you some more next week ... hopefully! :0) Oh ... and if you'd like to take a peek at the true colour of the walls (it's a bit hard to get a good pic in the current overcast weather) you can pop over here ... the colour we're using is "Sea Note". Now to the "Project" in my heading. Another of my projects has been published in "Handmade", with my complimentary issue arriving today. Well, here we are again at "Sunday". How on earth does Sunday roll around so darn QUICKLY?!?!? This week sure has flown by with barely enough time for me to blink, so I thought I'd better catch you up on what I've been doing. Firstly ... I popped into my Home-away-from-home on Thursday after I finished work to lend a helping hand with Marion and Steph's ongoing Flood Appeal Quilt Drive. There may not have been many people there, but there sure was evidence that they HAD been there ... Marion told me there are now 132 quilts completely finished, with quite a few more scattered around with people working on them at home! WOW! Well done to everyone who's been involved in any way at all! What a HUGE effort! I also got to catch up with Marcia (she of the 'Girls' Stitch In' karaoke!!) and met the lovely Helen, who had travelled up from Ipswich specially to help out with the quilt drive, even though she said she still had her patchwork/quilting "L" plate! 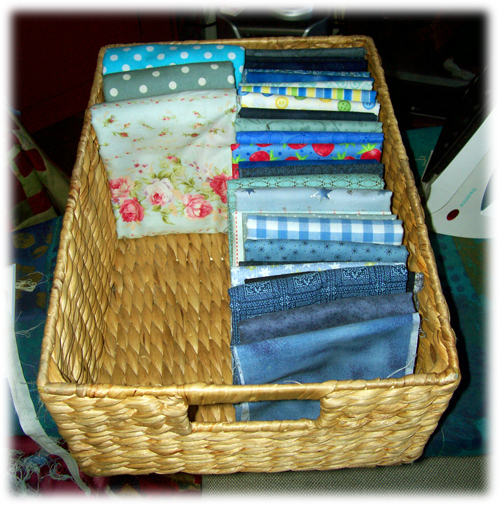 :0) I was designated "Go-fer" and did more ironing of seams and backing fabric than I ever do of clothes at home! I'm smart enough to have a LOT of non-iron clothes! Tee! Hee! Hee! 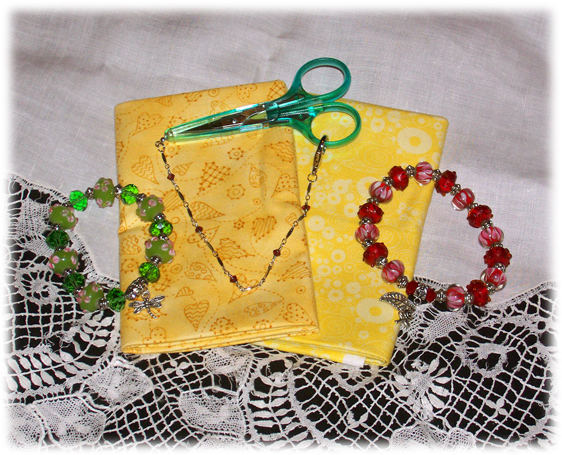 Here are my GOODIES from the day ... two pieces of yellow fabric ... nice yellows are hard to find, so I grab them when I can and these were in 30cm strips, rather than fat quarters, which I find more useful for what I tend to use them for. Two pretty beady bracelets ... the beads were so pretty and since I'm too lazy to make some for myself, these were just the ticket ... the green one has a dragonfly charm hanging from it and the red one has a leaf and a rose. I popped the red one on straight away, as it matched my outfit! :0) And lastly, I shouted myself a pretty new pair of stitching scissors. The blades are quite sharp and pointy, which will be great for getting into small spots to snip threads and I liked the idea of the blade guard so I don't poke myself when the scissors are in my sewing pouch ... and the little beaded chain hooking the guard to the scissors means it will be harder for me to lose it ... not IMPOSSIBLE, you understand, just HARDER! Tee! Hee! Hee! So, all in all, I lovely day out ... and housework was successfully avoided by both Lynette and I! Tee! Hee! Hee! 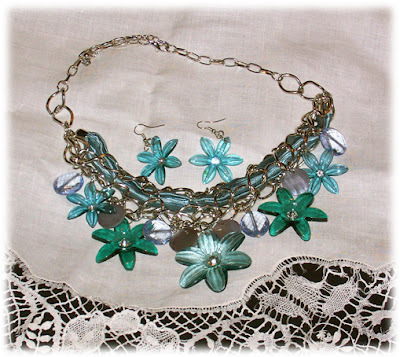 This isn't my usual style, but such a pretty colour green that I'm sure I'll find something it will go with. My parents-in-law gave me this flowery necklace and earrings. 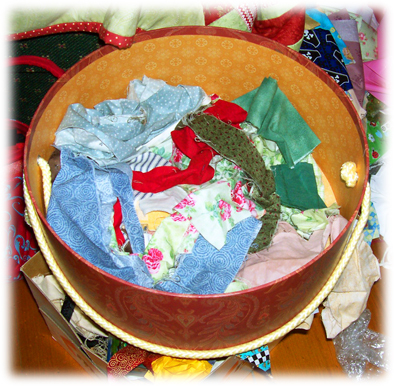 As I work my way through the LOOOOOOOOOOONG process of sorting, ironing and folding my stash, I'm using it to store pieces of fabric that are still big enough to be useful for applique` or smaller patchwork projects, but not big enough to be able to fold and fit in my stash baskets. Thanks Marion and Steph!! :0) Steph and I always remember each other's birthdays, cos they're just two days apart! Tee! Hee! Hee! As you can see ... 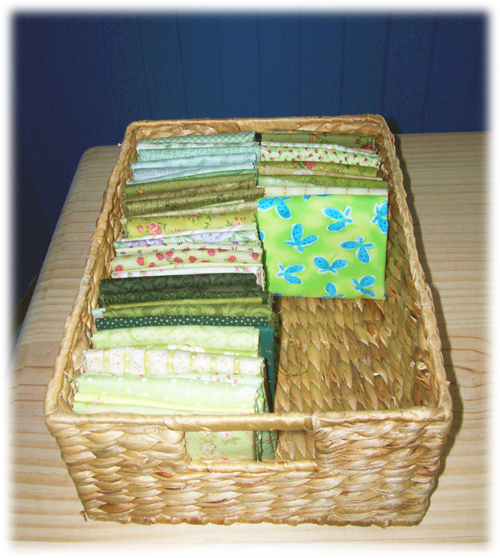 I've moved on from green to blue ... though I am still finding the odd green fabric mixed in with other colours. I may still be doing this at Christmas!!! EEK!!! So ... there you go ... a round-up of the end of my week. It sure has been a busy one and I'm hoping by the end of today, I'll feel like it's been a bit more productive too. Starting to stress a bit cos there's been NO sewing happening here for the last couple of weeks ... not even any hand stitching, since the time I usually do hand stitching has been highjacked by the stash sorting. SIGH!!! I hate to admit it, but this may be the first time since May Britt and I started OPAM in 2009 that I will have ZERO finishes to report for a month!!! What a bad example I am!! 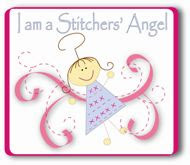 Still ... Peg is such a Super-Stitcher that she makes up for my slackness! 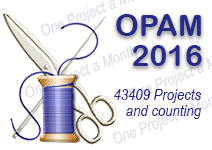 :0) Don't forget OPAM gals ... it's almost that time of the month again, so be sure to update your sidebar finishes lists and drop Peg or I an email ... remembering that the lovely Peg does NOT have an "H" in her surname. 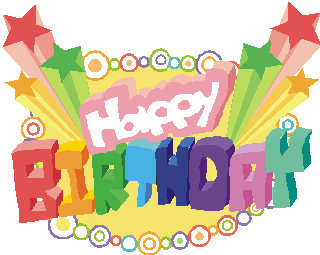 And a big thank you to all of you lovely blogging buddies who've sent birthday wishes too ... I know I have been a bit slack in replying to comments and emails in the last week or so ... somehow I keep running out of hours in my days! :0) But be assured your well wishes made Sunday even more special! 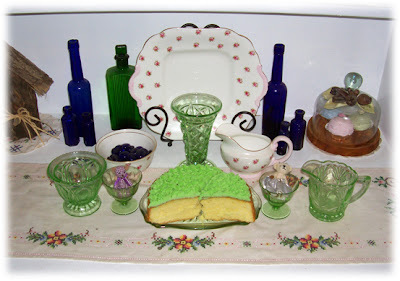 Oh ... and do you see the pretty green depression glass vase in the centre of the cake pic? That was my GORGEOUS birthday giftie from my bestest-buddy-since-we-were-nine Lynette. It looks great with my little collection of depression glass on the hutch and is a great size to pop flowers in, too ... oddly enough since that's actually what it was designed to do!!! Cake and gifties ... it's almost worth having to turn another year older! Tee! Hee! Hee! Getting up to date with my mailing! EEP! Apologies to the gals who have been so patiently waiting for their prizes! 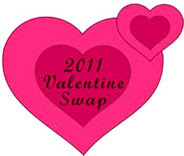 I'm off to see my Australia Post buddy Raymond tomorrow, girls, so start stalking your posties next week. Posties of the world .... BEWARE!!! Tee! Hee! Hee! 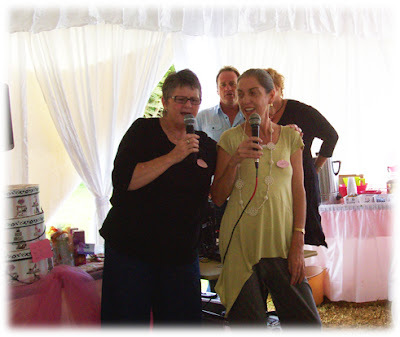 "Sewing Room Renovation Stress Support Group"
Congratulations to you both! If you'd like to email your snail mail addresses to me, I'll pop your prizes in the mail for you. 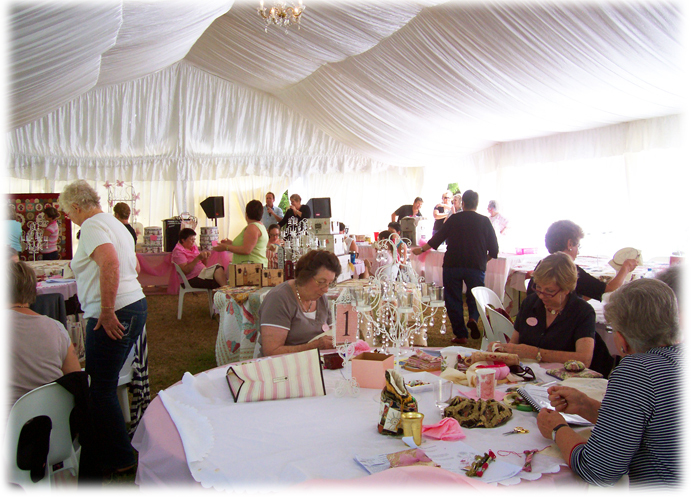 "Taking time out to appreciate the joys of being a woman and embracing all things 'girly'!" ... THIS!! You can just see one of the chandeliers in the centre top, but you get a good idea of the rest of it! 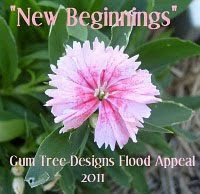 :0) On top of this, two guest designers were on hand with brand new projects designed especially for "Girls Stitch In". 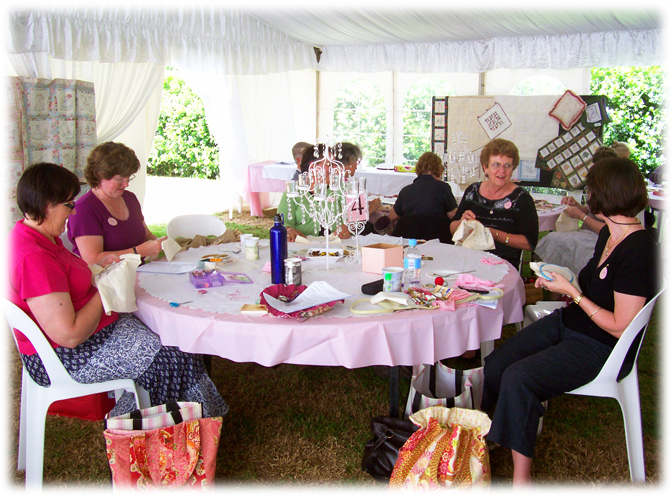 This year, the guest designers were Sue Daly of "Patchwork With Busy Fingers" and Linda Blake of "Bella Embroidery". 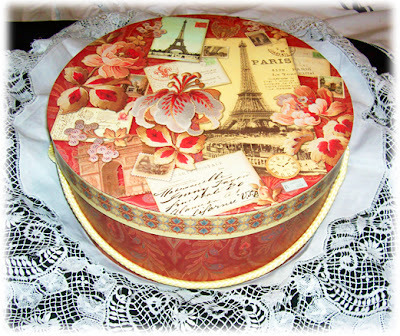 Throw in a GORGEOUS Parisian-inspired bag full of goodies and everyone was in girly heaven! :0) Yep ... a day of stitching and indulgence ... including DELICIOUS morning and afternoon tea and a healthy but SCRUMPTIOUS lunch ... with live entertainment!! 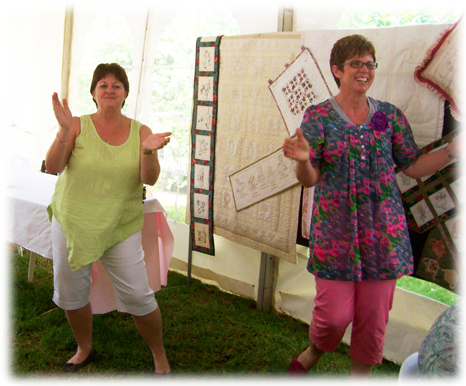 ... the party girls were bustin' out their moves! :0) Sue confessed that it was just as well she hadn't had a glass of wine with lunch or she'd have been dancing on the tables ... we offered to get a glass and clear a table for her, but she declined! Tee! Hee! Hee! Oh ... and just in case you were wondering where I was ... in that gap between Sue and Marion! :0) But you'd probably guessed that, right! Tee! Hee! Hee! 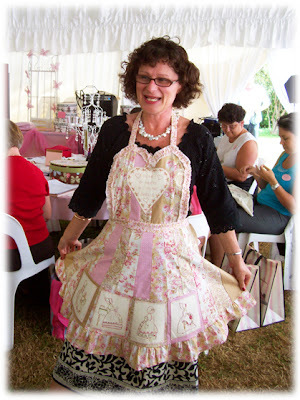 This looks like a nice, sedate picture of Linda modelling her gorgeous project for the weekend, a girly-girl apron featuring her signature crinoline ladies, right? HOWEVER ... there was a slightly SAUCIER modelling of this apron that involved Linda's skirt hem going up and a bit more leg showing!!! The French Maid's version of the apron perhaps!! Ooh! La! La! :0) I was too shocked to take a pic! Tee! Hee! Hee! While I was out chatting, dancing and being spoilt by Marion, my Beloved Geek Boy was beavering away in the sewing room to prepare it for it's new colour. So ... I have a question for you ... What is "Sea Note"?? Answer: It's the colour I'm painting myself ... Oops! ... 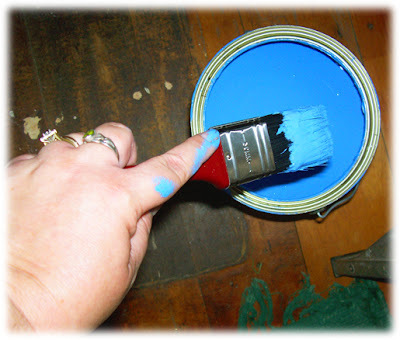 I mean ... it's the colour I'm painting the sewing room!! :0) Yes, I started painting the section GB had filled and sanded cos I just couldn't wait to see how the colour looked on my walls! :0) I am STOKED at how it's coming up and can't wait to see it all finished and decked out! It will be so exciting to have a neat, tidy, stylish creative space to work in ... even if it isn't likely to stay neat and tidy for very long! Tee! Hee! Hee! There's still piles of 'stuff' for me to sort through, but I'm making progress ... slowly!!! 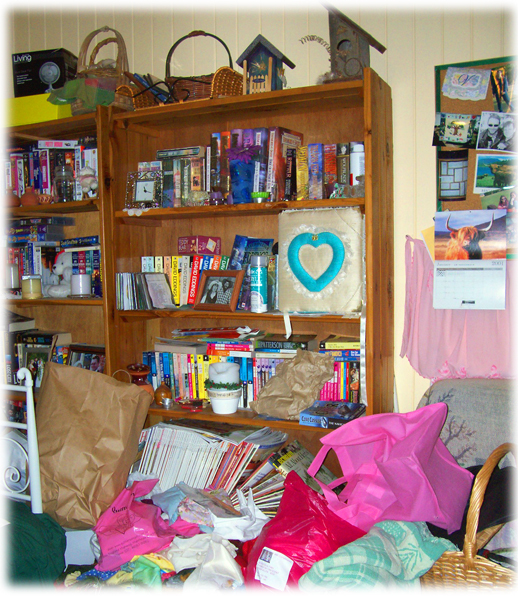 Project "Sewing Room Make Over & De-clutter" is still underway. There has been progress ... it just seems to have been a bit slower than hoped for due to a busy week. Will show some update photos in the next few days ... promise! :0) And my messy sewing room confessions have brought a few more "Chaotic Creators" out of the closet ... pop across to encourage my blogging buddy Toni ... she's also decided to be brave and tackle her creative chaos. :0) We can do it Toni!!! In between work and de-cluttering, I've managed to finish writing instructions etc. 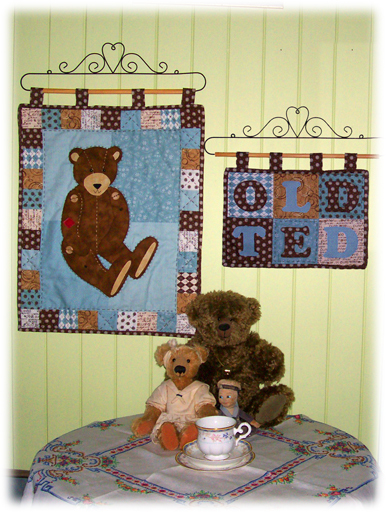 for my latest pattern design ... "Old Ted Wall Hangings". 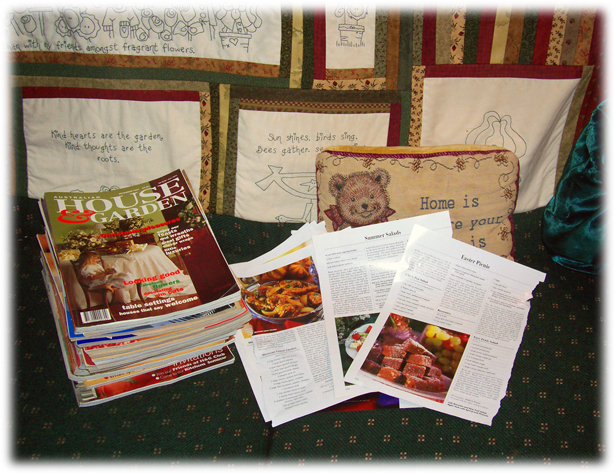 When I wasn't working, de-cluttering or writing pattern instructions ... I've spent a bit of time at my Home-away-from-home this last week helping the lovely Marion and Steph get ready for a very special event that's on this weekend. And since I'm about to head off to spend some time there ... I'll tell you all about it next post! :0) I know ... I'm a horrible tease ... but you LOVE me!! Tee! Hee! Hee! 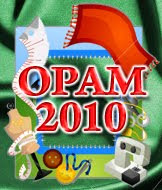 Now that I've showed you my reason for being a bit later than expected with my OPAM winners, I'd better tell you who was chosen by the random number generator thingy. :0) First, can I say a huge ..
Congrats, gals! If you can email me with your snail mail addresses, I'll pop a little surprise into the post for you. Now since this was a double-whammy prize draw for January AND February ... you'll be wondering where the January winners are ... well, you'll just have to hop on over to Peg's blog (if you haven't already!!) 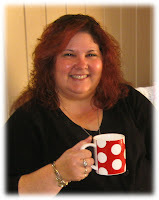 where she posted her three prize winners this morning ... Peg's an early bird and I'm a night owl! Tee! Hee! Hee! Oh ... and keep an eye on your OPAM badge in the next few days ... my Beloved Geek Boy will once again update the total number of projects completed since OPAM began ... the smaller writing at the bottom of the button (which should currently be green) will change to BLUE. If your smaller writing is still red, drop me an email and I'll give you some super-simple steps to follow to get the button loaded up properly so your button receives the monthly updates automatically. I'm going to be REALLY RUTHLESS!!! Sort of! A bit! Maybe .... Awwwwww .... who am I kidding! I'm really not good at being ruthless!!! No, no ... 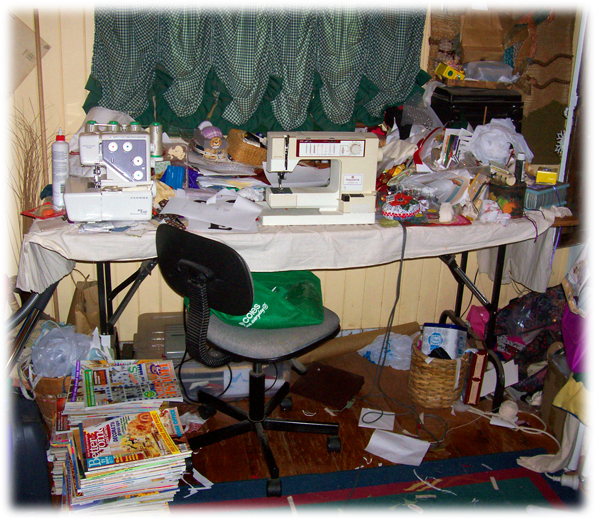 I'm not thinking of attacking anyone or invading a small island nation ... just getting ready to attack a HUGE task ... Spring cleaning the sewing room!! EEP! 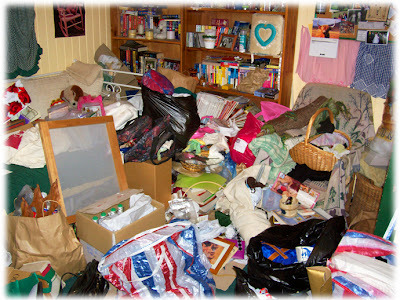 It's sort of a long story ... you see ... it all began when we bought and moved into this house. 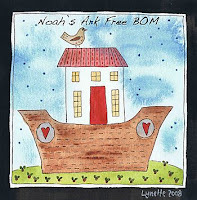 Previously, we'd been renting a HUGE old farm house ... the equivalent of a six bedroom, plus large dining room, plus sitting room, plus huge lounge room house. 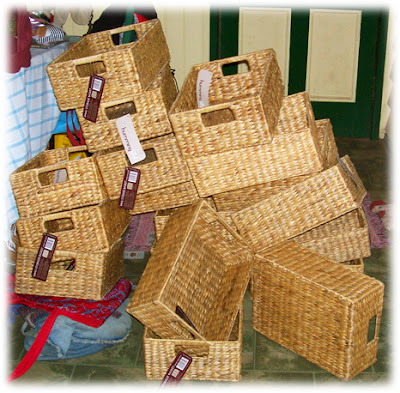 Which we very quickly filled with 'stuff'! So then we bought our current cute Federation cottage ... which has four bedrooms, a small lounge room, small dining room, and a kitchen we renovated a year and a half ago. You can imagine, then, just how much of a challenge it's been for two collectors (my Mother says hoarders, but that sounds so harsh!!!) to downsize enough to fit. Storage is ALWAYS a problem. And although we've cleared out a lot of 'stuff' as we've renovated each room, the two most challenging rooms have been left til last ... the office and ... MY SEWING ROOM!!! Each of these rooms contains the contents intended by their titles ... along with all the 'stuff' that didn't fit anywhere else. Are you getting a mental picture here?? 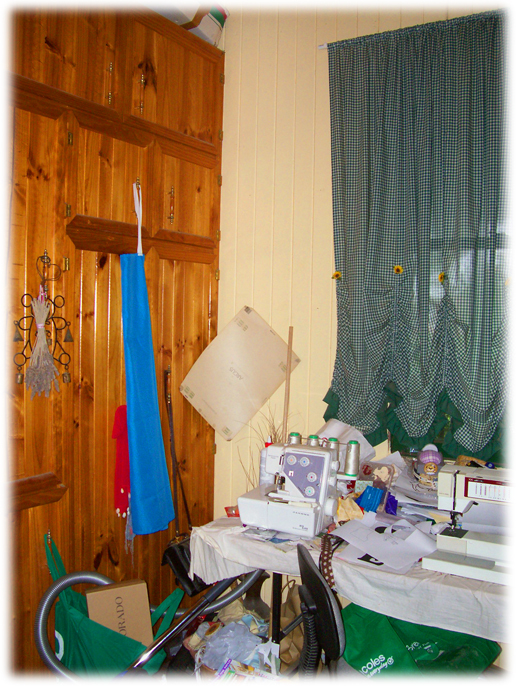 Let me show you a few actually pictures of my sewing room. I know I've shown a few over the time, but this is what it looks like today. These are the only built in cupboards in the house and not only are they fairly unattractive, they're incredibly badly designed and pretty hopeless at being useful storage space. 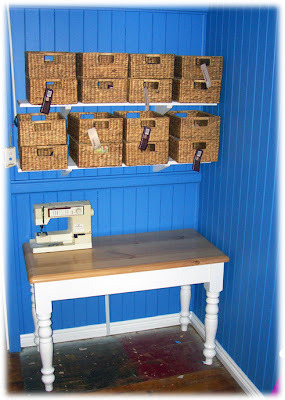 There's actually two banks of these along the entire wall that has the entry door to the sewing room in it and because the sewing room also has windows on two walls, it severely limits how I can arrange furniture. Two large bookshelves that used to be in the 'library' in the farm house. At the bottom of the picture, you can see that my stash is in complete disarray ... funny ... it USED to fit into that container! Tee! Hee! Hee! 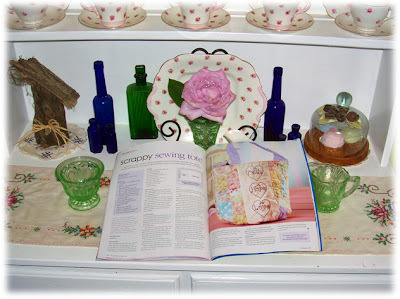 "Project Sewing Room Makeover & De-Clutter".